Word crimes | Kate or Die! So much has been happening, oh my god. I made a summary tumblr post, and it’ll do a better job than I can right now. I went to Philadelphia, I wrote comics, I signed comics, I sold comics, I drew comics. What the hell else do I ever do? Ah: I do a podcast… ABOUT COMICS! 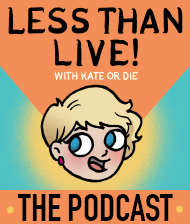 LESS THAN LIVE with Kate or Die is up to episode 3! 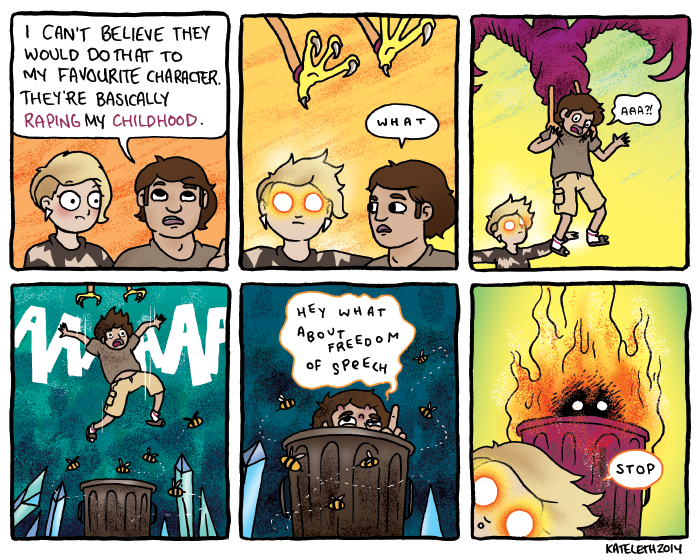 Our last guest was the incredible, inimitable Babs Tarr, who was recently announced as the upcoming artist on Batgirl. She’s a wicked illustrator and someone I’m a big fan of. She rules, basically, and we talk for almost an hour about her takeover, about moving into the world of sequential art, and naturally a hell of a lot about Sailor Moon. Plus, in episode 3, I sing. This is a bad update. You’re all so attractive. I will be in NYC for a week starting on Monday, so don’t expect comics here during that time. Follow me on the tweeter, if you’re into it! Also, if you’ve ever noticed the Donate button up on the top of the page, you are more than welcome to click that. That’d be cool of you.